Sorry for the lack of posts recently but I’ve been away on various short trips – Gloucestershire and Bristol, Spain and Berlin. They have all been jolly and I’ve particularly enjoyed the buzz of large towns and cities – and dressing accordingly. So a return to solitary gardening; to shabby clothes, muddy knees and damp socks; dirty nails, frozen fingers and back ache has been rather a bump. And suddenly the seasonal change is obvious, isn’t it? 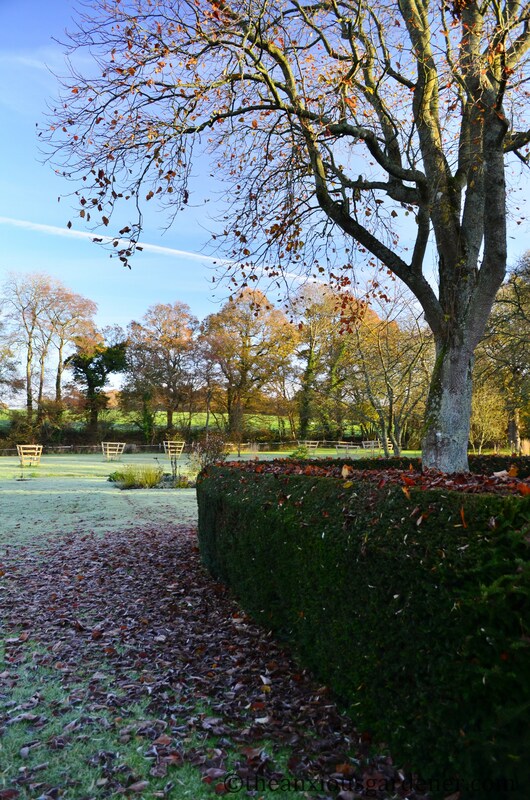 Now the ground is sodden (or crisp with frost) and the days cold, gloomy and dank – a bit like my mood. But occasionally the sun has brought a smile to my gardening grumpy-dom. The tulip tree, which featured so handsomely in my last post, has now kindly dumped its leaves for me to pick up. Thanks for that, tulip tree. I’ve been quietly wheeling my barrow about and raking. Wheeling about and then raking some more. 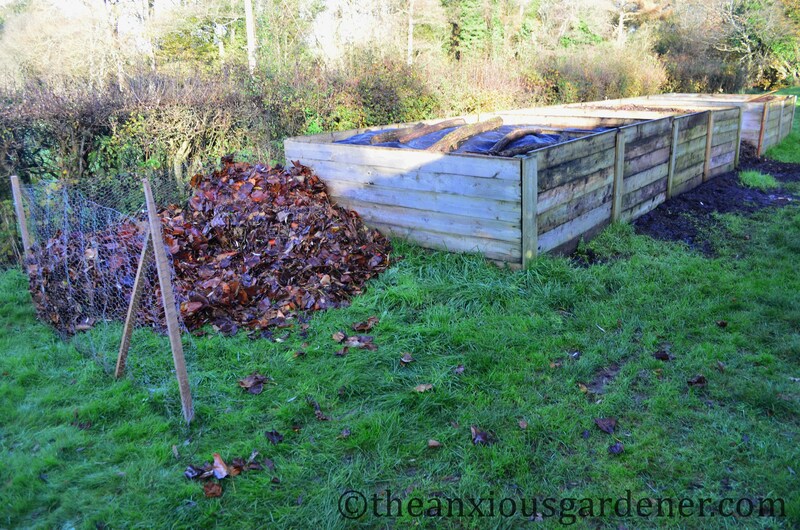 But that’s OK – I need the leaves; annual leaf-mould production is underway. I’ve built a temporary leaf container next to the compost bins – as I do every year. I’ll need to jump up and down on it – cackling – to cram in all the garden’s leaves. After a couple of months or so, when it has all reduced in bulk, I’ll transfer it to one of the wooden bins and leave for a couple of years. (I decided last year to switch to a two-year leaf mould cycle – twelve months provides a fine result but still has wodges of unbroken-down material). If the ground wasn’t so soggy, I needn’t rake. I could ride about in ever decreasing circles, gathering up the leaf-fall with the ride-on mower. But it is, so I can’t. though the leaves of the weeping willow won’t be rushed. 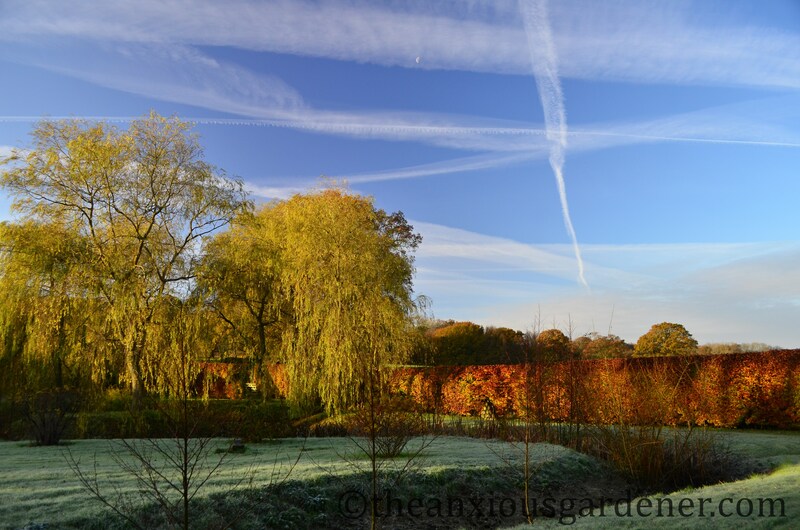 (Excuse two very similar photos but I liked the dissipating vapour trails and tiny, day-time moon). 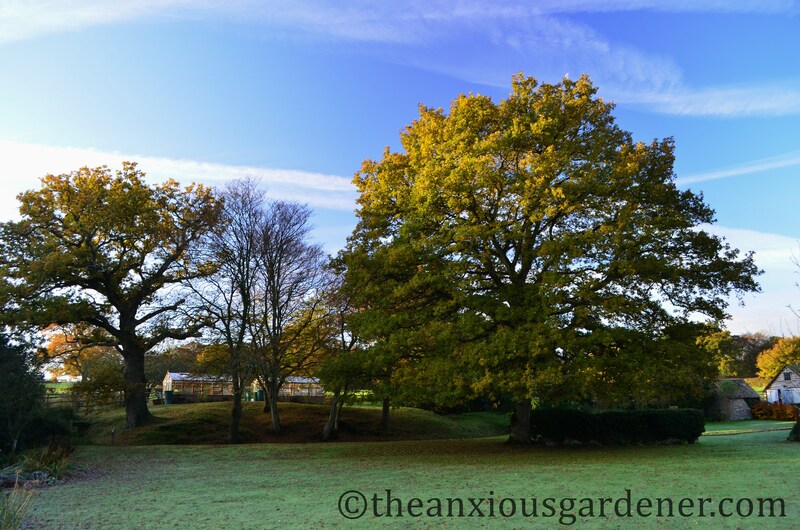 The oak leaves cling on as well – they have barely started dropping. and as there are so many oaks, there will be plenty more leaves for me to rake and pick-up. Yep, I’ll be raking, leaf-blowing and mowing up leaves for quite some time yet. And on sunny days at least, I don’t mind in the slightest. It’s always a great feeling when you get the last of those leaves raked! Beautiful pictures of what looks like a fabulous garden. I only discovered you this morning, but looking forward to returning many times. Wish I had large trees in the garden so I could do the lovely leaf mould stuff too. Ah you came dangerously close to our border 😉 We have been hopping about busily too, though only within the Uk. Last weekend saw us right on your doorstep again (I imagine) in Camber, leaving the poor garden to fend for itself once more while we were listening to loud live music and taking walks on the beach! 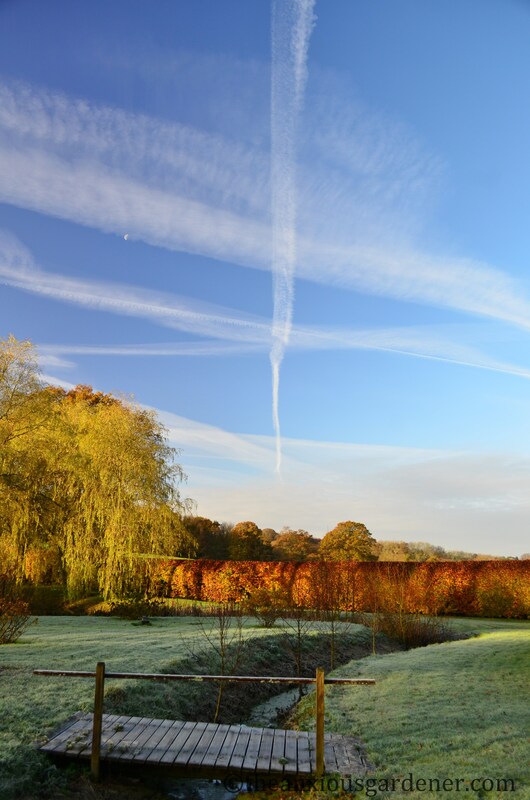 Lovely pictures of winter skies and plane trails; there is something about a crisp sunny winter day… particularly from the retreat of a roaring fire :). It’s funny isn’t it, I’d hardly been to the SE before last year (apart from passing through on the way to Dover!) and suddenly lots of things have been drawing us there. My best friend has moved near Canterbury so we’ll continue to shuttle across a few times a year for the foreseeable future! Ah, no cottage for us, we were slumming it; had our first (and last I suspect!) experience of Pontins as the festival had taken over the entire site for the weekend and accommodation was included with the tickets. Better than camping at this time of year at least! 🙂 It was the last of its kind so had to be done really. The music was great and the weather kind. I do love the west country, can think of many worse places to end up – no year is complete without at least a weekend down that way. You packed quite a bit into your time away. Sounds like some great trips. I love the chance to sample city life when I get the chance. Although I find London too much for my country bumpkin tendencies. I was stood in the middle of 8 lanes of traffic last week and felt like a rabbit in the headlights. Welcome back, I missed your dry humour. The beech hedge is stunning. 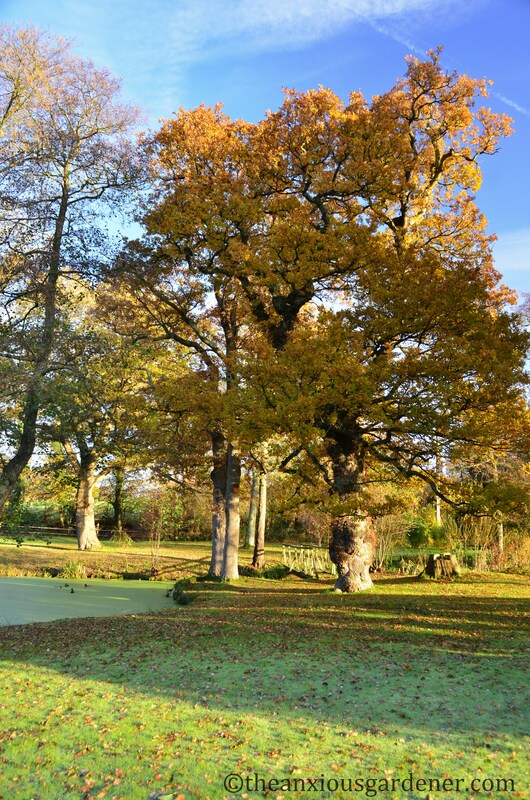 I think you could do the same thing here with oaks as they keep their leaves until spring just like beech do in the UK. I’ve not really seen beech hedges here, I’ll have to try and wind out why. There’s something poetic about the images you take and the series in how you put them together. Glad to hear you’ve had a fab time travelling! You are such a hardy soul raking up your leaves in damp socks in November. I am guilty of leaving mine to be mulched up by the mower – such a waste. Thanks David, have missed your posts. Amazing to see the change of seasons. Here in SE Qld November has been hot and stormy. The first day of summer was cooler and balmy. Not for long though; a hot summer is predicted. 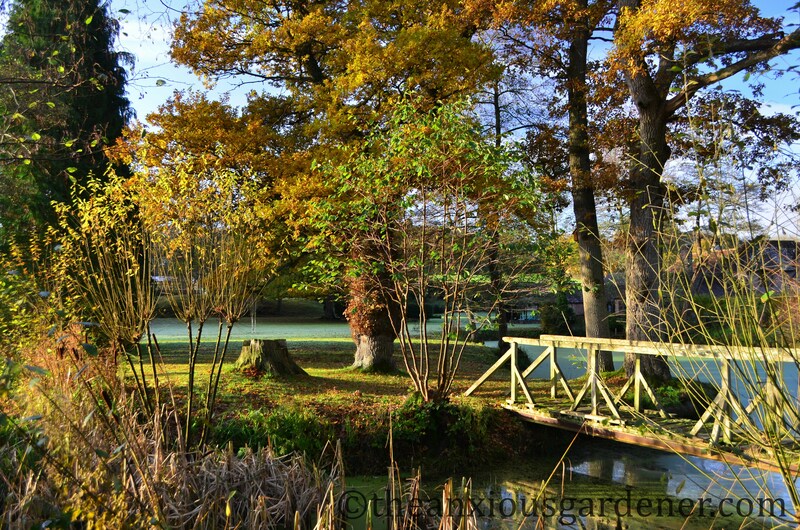 At these times I love reading about British gardens – well any time really to be honest. Many thanks, much appreciated. 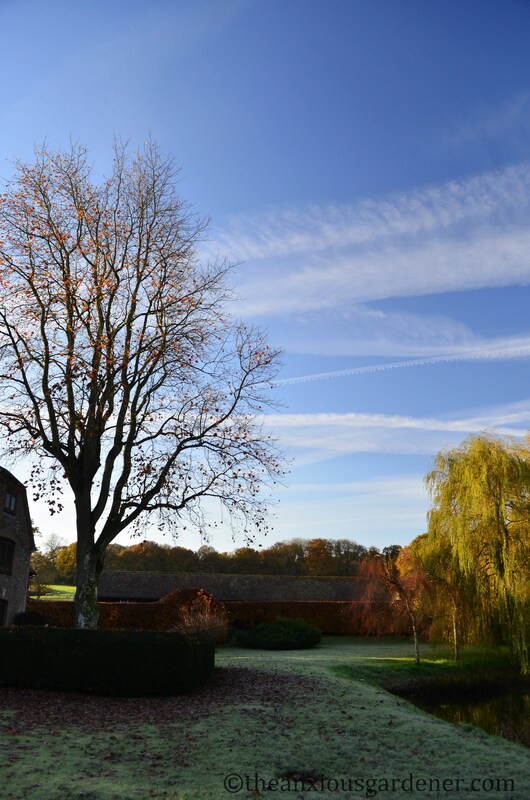 Beech trees and a stunning blue sky, couldn’t be better! Your hedge is looking fantastic, beautifully cut and so colourful. So glad you have been enjoying yourself, I have missed your posts! Tell us about your trips! Nice to have you back I thought you’d deserted us and all the time you have just gone off to enjoy yourself – it just not on! Lovely sunny leafy pics. 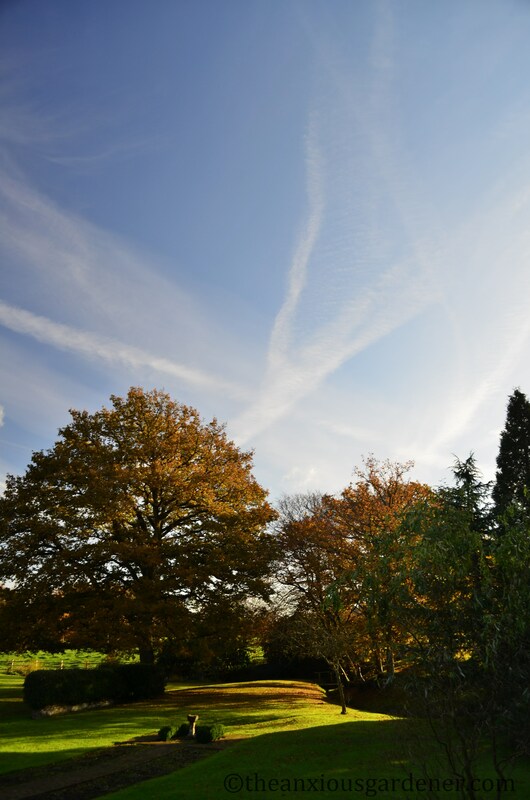 I can think of worse ways to spend a sunny day than raking leaves in such a beautiul environment, but after your brush with civilisation it must be a bit of an adjustment. 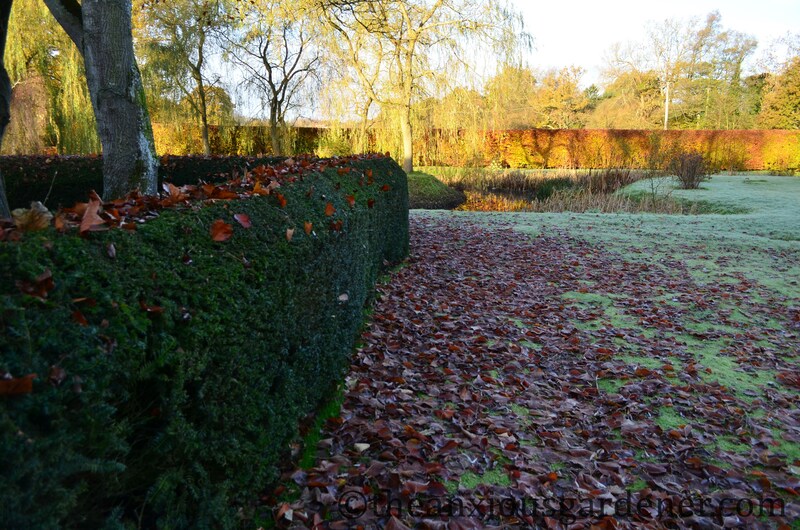 I love the contrast between the weeping willows and the burnished beech hedge, really beautiful. Such a shame you can’t collect in the comfort of a ride-on mucnhing machine though, despite the noise. Am glad you included the vapour trail and incy wincy moon. I really must inspect my leadf mould, I suspect it too could benefit from another year, or at least a few months.